There is in fact a quick intro to the Linux hdparm stuff I helped add to the manual at http://www.postgresql.org/do cs/current/static/wal-reliability.html but it falls rather short of complete. Are those 414 random seeks reads or writes or a mix of both? For reads this number should be much higher. The bonnie++ random seeks number is a mix of reads and writes using 3 processes. If you look at the "Database hardware benchmarking" presentation on my web page (linked to right at the end) you'll find a slide covering this. Those seek numbers are also relative to the size of the file the benchmark allocates. What about lag time? I'd think that the greatest benefit to SSD would be vastly smaller lag time on small writes, rather than throughput on large writes. The random seek numbers should give an idea about lag time. But in principle I had assumed that the lag time would be much better with SSDs anyway and concentrated on the sequential performance and the effect of the write cache, because those were the unknowns for me. First, if you use Bonnie 1.95 you can get lag time numbers which would be useful. Overally the SSD numbers don't look very impressive compared to standard HDD RAID, especially given the limited lifetime of SSDs. 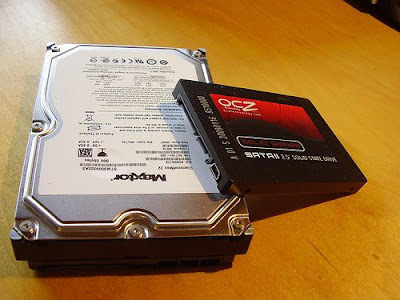 I'd be interested to see what you can do with a RAID of SSDs, and how much it costs. It looks like Bonnie did not have sufficient IO queue depth. These SSDs have 10 channels. So, their random "seek" performance heavily depends on long queue, all way up to 32, which is SATA NCQ spec limit. Wow...what an eye-opener. Only 414 R/W IOPS from a device advertised by Intel to do 35,000 reads and 7,000 writes!?!?! 414 IOPS is only about 2x what a 10,000rpm HDD can do with its write cache disabled. Essentially this means I could use a 4-disk RAID-10 array and get BETTER performance than X25-E SSD, with an extra 500GB of capacity for free. I am curious, why does Intel fail to disclose the size of the DRAM write cache in the X25-E documentation? The test is just wrong. 414 R/W IOPS. Somebody above said: "The test is just wrong. 414 R/W IOPS. More like 4,000. I wish. There are some very interesting comments on a recent Flash benchmark run by Sun/Oracle here that seem to validate the (much) lower 414 IOPS number. In a nutshell...Sun/Oracle ran a PeopleSoft Payroll benchmark on a two-tier setup: 40xSSDs (SLC) plus a striped array of 12 15KHDDs. They then compared this to a single tier of 62x15KHDDs, and the performance was (as it turned out) identical. For simplicity, lets ignore the 12x15K HDDs in the SSD setup and just say that the "performance equivalence" ratio in this application was 40xSSD = 62xHDD, or 1.5:1. In this light the 441 r/w IOPS for the Intel X25E on Bonnie++ seems right in line. Unfortunately...this is between 1/10th and 1/100th of what the SSD makers are putting in spec sheets. Re: "It looks like Bonnie did not have sufficient queue depth...up to 32"
Well...maybe that's why the Bonnie++ results look more like the real world than the vendor spec-sheets, and if so that's a good thing! I have been profiling enterprise application workloads for almost 10 yrs and I can't recall seeing a queue depth at the target (HDD) end of more than 2 or 3 outstanding requests. I notice Intel (and seemingly everyone elses) numbers are always based on 32 deep queues -- which is meaningless. As far as I'm concerned, for any given application I need to see REAL WORLD SSD "performance equivalence" of about 10:1 (replace 10 fast-spinners with 1 SSD) before it's cost-effective to start building two-tier setups for performance critical apps. So far, Flash SSD isn't even close. I wish I had a Fusion-io device to lend you for another test run. They claim the cheapest version has 89000 - 119000 IOPS. I wonder what the real-world numbers are. I wonder what happens when you flick the power off in the middle of a db txn on this device. Interlude: The disk write cache is the feature that causes you to lose your data when the server machine crashes or loses power. some ssd devices (at least intel 320 ssd drives) have capacitors, which allows to flush cache after power failure or another incident. @edo: Yes, that's the sort of thing you need. The X25-E didn't have that, but all the newer SSDs intended for server use ought to have them. The trick might be to get information from the manufacturer or vendor to verify that.